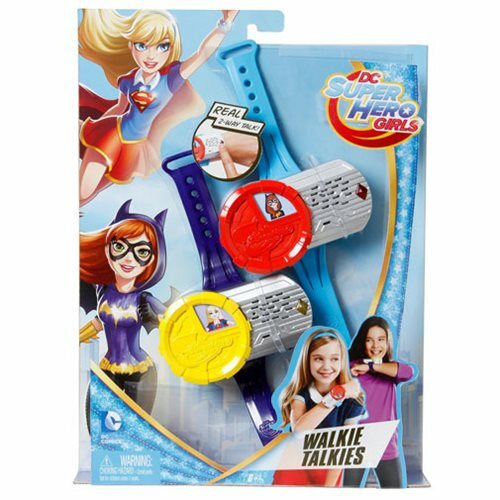 Act out your adventures and find your own inner Super Hero with these real wrist walkie-talkies inspired by the action in the animated shorts of DC Super Hero Girls. With 2 wrist communicators included in the pack, the role play fun is doubled right out of the box! Turn the dial to change the image of the character you are communicating with, and easily activate the walkie-talkies to interact with each other and stay in touch while playing out DC Comics super hero adventures. Requires 2x "AAA" batteries, not included. Ages 6 and up. Ladies, Strike a Pose With These DC Super Hero Girls Items!